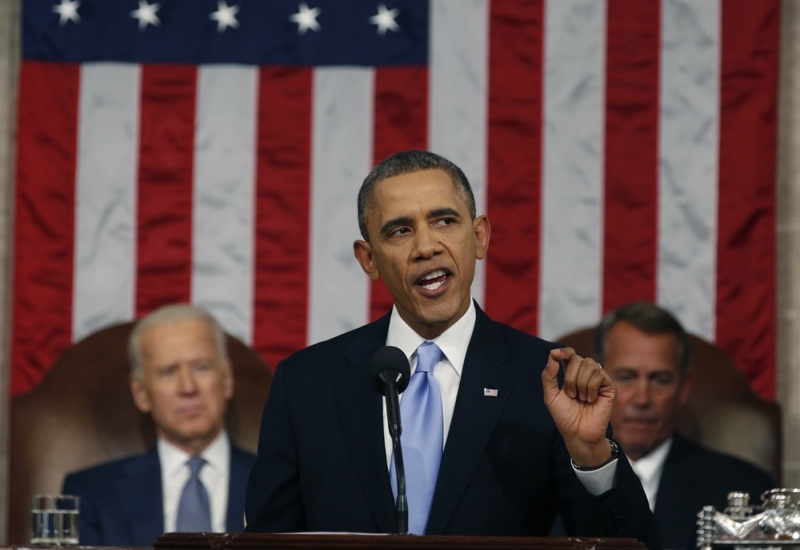 Tuesday evening President Obama addressed the nation for his State of the Union speech. As usual, this was a horse and pony show with little in the way of substance and less in the way of honesty. As usual, the president intends to correct the nations problems with more of the same – more government. The nation is crumbling beneath weight of a Leviathan government, and the president’s solution is to feed Leviathan more. The president threw out a lot of cherry-picked statistics and funny figures. One of them was a claim that unemployment is the lowest it’s been in 5 years. While this is technically true based upon the politically convenient method used to measure it, the figure forgets the millions of individuals who are no longer looking for work. The people who have given up on the job market aren’t counted toward the official unemployment numbers. He goes on to talk about how “if you work hard and take responsibility you can get ahead in America”. This is a very interesting remark considering the source. This president has made it his mission not only to discourage hard work, but also to demonize those who are the most successful. He’s also put forth a mighty effort to offload personal responsibility to the government by supporting laws, regulations, and programs that seek to eliminate personal responsibility for income, job training, personal defense, healthcare, and a myriad of other choices that belong to the individual alone. About 8 minutes into the speech the president made a declaration that whenever and wherever possible he would take steps without congress. Ladies and gentleman – the Emperor has no cloths and he’s daring you to point it out. This man is the president. He was elected by and is beholden to the people and bound by the Constitution with limited powers as part of the separation between the executive, Congress and the judicial branches. He is not an emperor or a king. He does not have the constitutional authority to rule by executive fiat. Mr. Obama moves on to taxation and deficit reduction around the 12 minute mark. He talks about how much money could be saved by closing tax loopholes. This statement should be offensive to every taxpayer in this country. Let us read between the lines here. The president is calling your tax dollars savings. He’s not talking about saving you money by levying less tax – no – he’s talking about taking more of your money. He’s using the word “savings” because he believes that the government is entitled to your earnings and you – you dirty little trickster – are stiffing the government by utilizing these so-called loopholes to keep more of your hard-earned money for yourself. Citizen, you should be ashamed. How is Mr. Obama and his family to afford their next multi-million dollar vacation? The idea that the government somehow owns your labor and the fruits thereof is despicable and should be thoroughly rejected by all thinking individuals. As the first black president, Mr. Obama should be acutely aware that slavery was abolished in 1865. Could someone please tell me where in the Constitution the federal government is given power to fund research? Apparently the president found it in there somewhere. He called for an end to funding cuts on research that were implemented last year. While government is running its highest deficits of all time, and hasn’t passed a budget in years we are supposed to spend more money that we don’t have on unconstitutional research. Leave the research to the market. When government funds research, it funds research to answer deep philosophical questions such as why lesbians are fat. Enough said. At this point in the speech Mr. Obama shifts focus to the environment and oil dependence. At the 16:30 minute mark he calls for more natural gas pumps in order to get more cars and trucks running on natural gas. It seems the president is getting the buggy before the horse. Natural gas pumps will not do anyone any good without natural gas powered cars, of which there are very few at the moment. A much better call would have been for the completion of the KeystoneXL pipeline to bring more oil to the US and help push down gasoline prices since gasoline is the number 1 fuel used in cars today. The president also stated that he’d be imposing more onerous regulations on automakers by tightening fuel efficiency rules on trunks. The president dropped a whopper at the 19:20 mark. He stated unequivocally that “the debate is settled; climate change is a fact!”. It seems that our president has ordained himself the final authority on a subject that is still being debated by – the far more learned – scientific community. I wish I could excuse this outburst as just the excited utterances of a novice, but unfortunately global warming, or climate change are far too politically appealing. This convenient climate crisis is just another excuse for the government to more deeply involve itself in the affairs of businesses and individuals in the name of the “greater good”. Remember the “cap-and-trade” scheme? Expect similar frauds to come along in the future. Immigration reform has been in the news recently as the next big issue Washington needs to act on. Mr. Obama took the opportunity to address the subject and offer his support for legalization of resident aliens. While I don’t have anything against immigration on its face, there are other matters to consider. The illegal bloc presents a huge number of votes that Democrats hope to buy through legal status and handouts. I’d be happy to offer citizenship to this individuals on the condition that they are not eligible for any type of welfare programs. At this same time, close all of the welfare programs to new non-immigrant applicants and allow these programs to fade from memory as attrition slowly decimates the ranks of dependents. Of course, as I was thinking this while watching the speech the President encouraged Congress to renew the unemployment insurance that recently lapsed. Where is the incentive to get a job if you can sit on your couch and get paid – in some cases more than what you were making – by the government? Around the 28 minute mark the president called for federal funding of pre-kindergarten. Again, the President must be reading something in the Constitution that I can’t seem to locate with a microscope. Where does it give the federal government any authority to be involved in education? It doesn’t. The Department of Education should be eliminated. This is something Reagan called for, but today sounds radical to most. Additionally, why would we want to send our children to the government indoctrination centers any sooner than we’d have to? Why should we send them at all? Public education, particularly now in the age of Common Core is a threat to the future of this country. It is designed to breed uniformity and instill a sense of reverence for the US Government. Thank God, I was homeschooled. Were I not, I might not have the clarity that I do now, and I find that idea frightening. Making the shift from education to jobs, and president spoke of income inequality between men and women. Sure, this phenomenon largely stems from our society’s patriarchal past, but there are reasons that it still happens today. Among them are that women allow it by not demanding equal pay if they discover that their employer is being discriminatory. That is assuming that the female employee is providing as much (if not more) value to the company as her male counterpart. These days though, I’m not sure how one goes about pinning down the statistics. Looking at most large companies, if you compare the male workforce you would find a fairly broad range of salaries depending on hire date. Employees with longer tenure generally make less than those more recently hired. This is a market issue, not a political one. Unfortunately it makes too fine a political fodder to leave be and allow the market to run its course. At this point the president widened the scope of alleged income inequality to include the entire lower and middle class and pushed for an increase in the federal minimum wage saying, “let’s give America a raise!”. Mr. Obama would do well to learn the economic consequences of the minimum wage. Contrary to the political fairy tale, the minimum wage is not an elevator lifting low skill workers up the employment ladder. Rather, the minimum wage functions as a buzz saw, hacking off the lower rungs of the ladder thereby placing employment for low-skill workers further out of reach. The market cannot justify paying $10.10 for jobs that don’t offer that much value to the employer. Perhaps the employer would hire individuals to do a job for $5/hr, but that’s illegal even if both consent. Higher mandatory wages increase automation and outsourcing as well as depress the desire of low-skill workers to develop better skills that would afford them a higher wage. Mr. Obama solidified his commitment to this atrocious economic policy by stating that he issued an executive order that all government contractors would be paid a minimum of $10.10 an hour. I’d love to mail him a copy of Henry Hazlett’s Economics in One Lesson but I’m sure he wouldn’t read it. At the 44:20 mark the president called our nation a democracy. This is just one of my pet-peeves. The United States of American is not a democracy. We are a constitutional republic. Democracy allows for majority rule. Our government is supposed to be designed to protect the minority. 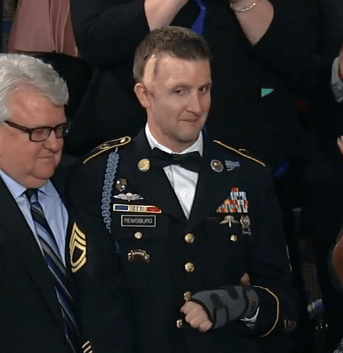 The real star of the address was not President Obama, but rather Cory Remsburg, a wounded soldier and audience prop. The president waxed poetic about Mr. Remsburg’s honor, heroism and sense of duty for so valiantly serving our nation and protecting our freedoms in the deserts of Afghanistan. Cory Remsburg was nearly killed by a roadside bomb that embedded shrapnel in his brain resulting in his loss of mobility, speech, and vision in one eye. While Mr. Remsburg is on the road to recovery, he will never be the same again. His body is broken beyond repair. When we look at Cory Remsburg we should see a fellow human being whose life has been irreparably altered needlessly. He was sent to fight in a war that wasn’t declared, against an enemy who wasn’t defined. Against an enemy who likely wouldn’t be an enemy if it weren’t for American hubris and our reckless foreign policy over the last century. This is what we are doing to our fellow men and women. We are sending them across the globe as cannon fodder. It’s time to stop glorifying American militarism. We don’t live in Rome. President Obama isn’t Julius Cesar. If we truly want peace, our actions must match our rhetoric. Bring the troops home, and keep them here. Put a stop to wars of aggression and return the military to its proper role as a defensive force only. Our problems as a country come not from a lack of government, but from far too much government. We need a majority political class that understands this.